How do I convert PMD models into PMX models? How do I fix the legs of my PMX model? 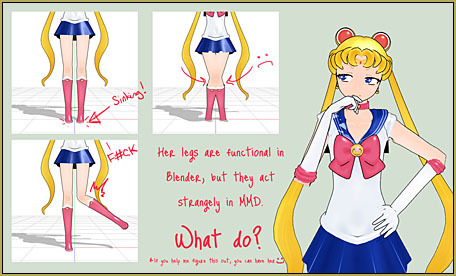 How can I add a mother bone to my MMD model? With Mother Bone And Chicken Leg Fix! There are a few reasons why you might want to change your PMD model to PMX. My first and most personal reason is that it’s easier to find parts for the model, since PMD will not use PMX parts. There are also less options for the edgeline, where you can’t change the opacity, size and color of it in PMD but you can in PMX. 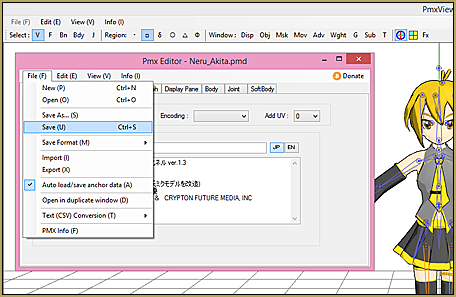 Using the program in general gives you many more options than PMDEditor as well. (thanks imalune!). Today I’m gonna teach you how to make a normal PMD model into a PMX, and there are several things to do. 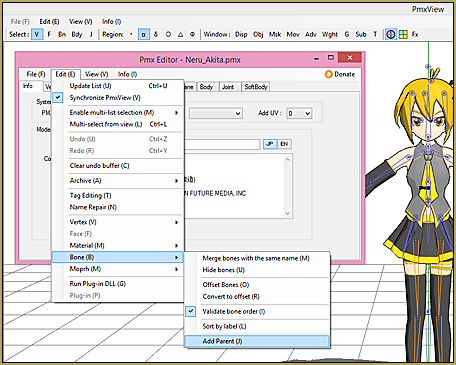 The two programs I am using today are MMD 9.26 and PMXE 0139, which can both be found on the LearnMMD Downloads page! 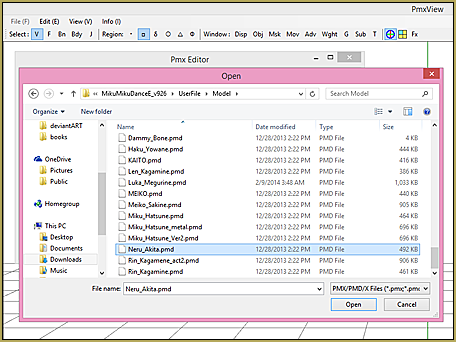 Convert PMD into PMX: Just Open and Save! First off, I will load the model into PMXE. 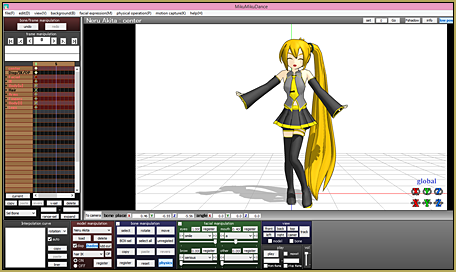 Locate the model in the appropriate folder (for the model I am using, it will be MikuMikuDance > UserFile > Model > Neru_Akita.pmd). Now that she/he’s loaded, just save it again under the same name. Now it’s a PMX… simple as that! Now let’s fix the mother bone on the model. To do this, look at the smaller window where the model is not at. It’s the same box you opened and saved the model from. At the top, click the dropdown and follow Edit (E) > Bone (B) > Add Parent (J). This will add the mother bone so that your model can turn without the legs going insane! Thank you for the image CandyRobot.DeviantArt.com! Not to worry, though! At the top are some tabs, and click on the tab that says Bone. There will be two options to choose from, and click the first option of the two. There are six different boxes there with an option above reading Limit Angle. For the top two, change the numbers to -180.0 and -0.5, then click the Limit Angle button. Then save it and that’s it! I’m having trouble finding the correct bones to fix the “chicken legs”. My model doesn’t seem to have the same naming as the one above. The IK bones (#74 and #75 in the pics above) are going to be move bones (square bones) located around the model’s ankles. The bones inside its IK chain (#62 and #63) are going to be knee and hip bones, in that order. Use your model to locate them. Or, just make a backup and play around, you’ll figure it out. so i successfully downloaded pmxe but the ui is way too big i can’t work properly, how can i fix this? Do you have a really small screen? I’m sorry, but I don’t think that PMXE’s window can ever be zoomed. Wow, very helpful ! Thanks a lot for this information. Thanks! This reverse-jointed problem has been plaguing me for a while, glad to finally found an answer to it! Also, good work on your first article, BPM!